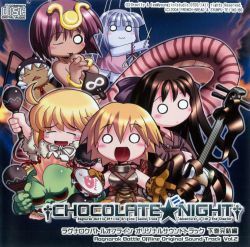 Ragnarok Battle Offline Original Sound Track Vol.2 "Chocolate Night" / ラグナロクバトルオフライン オリジナルサウンドトラック下巻完結編 CHOCOLATE★NIGHT / Ragnarok Battle Offline Original Sound Track Vol.2 "Chocolate Night"
Ragnarok Battle Offline Original Sound Track Vol.2 "Chocolate Night"
All tracks composed by Raito. Tracks 10 and 11 on disc 2 are from the OP/ED single (FBCD-011), composed, arranged and performed by KAZAHA. Santaruru is an alias for Manabu Namiki.